Booked Dancing Bear last minute due to an unexpected trip. Staff was very helpful and professional. Our cabin was relax ready the moment we opened the door. The views are spectacular and nothing beats the sound of nature. Our family will definitely be returning. Most Relaxing Stay Ever My wife and I came to "Take a Breath" on a recommendation from a friend. From the moment that we walked in, this place felt like home. Comfortable and super clean with so many unique features it is almost unbelievable. The beds are very comfortable, the 2 headed shower is amazing, and the 32 inch TV in the bathroom with Netflix is wonderful. The furniture is so comfortable and it was a relaxation dream for us. we will be back again soon. The fire pit area is set up perfectly and the owners left us a new bag of marshmallows, chocolate bars and graham crackers. It was the best vacation we have had in years. PS The same deer family came to the property every morning and evening and they were so beautiful and not scared of us at all. They even seemed to pose for pictures. Great Cabin This cabin is a perfect place for a weekend getaway. I brought my wife a 2 kids. Each room is so different and unique. The TV in the bathroom actually takes the cake. I watched netflix in the tub. There are games and tons of dvds. I even like the recommendation book that the owners provided. It was cozy and yet huge inside and the firepit area was awesome. I highly recommend this cabin. Every detail was thought out and we will be back. Everyone has been a pleasure, from the first phone call to our arrival! We are looking forward to another visit! Beautiful mountain views! Love the solitude! It was lovely! Excellent stay! Very peaceful and relaxing 25th anniversary! All the comforts of home! Loved the cabin and the view! All staff was extremely helpful! This most recent visit was our third stay at Coyote Bluff Cabin (our favorite) and at least our seventh stay at a Wilderness View cabin. The fact that we continue to return there time after time should speak well-enough for itself. The setting is perfect for a mountain wilderness retreat: wonderful views, peaceful and quiet - a great break from the city. The cabins are kept very clean and outfitted with all the modern conveniences one would expect. The service is outstanding: the help are most ingratiating and eager to make ones stay a pleasant one. The best compliment I can offer is the fact that we are regular customers of this fine establishment! We stayed at Laurels Rest Cabin last weekend and had the most enjoyable, relaxing time. The cabin is very cozy and comfortable, making us feel like we were in our home away from home. This cabin allows pets so we were able to bring our dog, which was a big reason why we picked this cabin. Bringing our dog and a covered hot tub, in case of rain. The cabin was very clean and very well maintained. Everyone from Wilderness View Cabins was exceptionally kind and went out of their way to accommodate us and were very friendly to talk to (which can be hard to find sometimes these days) I am an EMT/ Firefighter and the first things I look for anytime I stay somewhere is the exits, smoke alarms, extinguishers, and how far away the nearest fire department is. Believe it or not I was impressed that there is a fire station not far away but we never heard a sound. We felt like we were on our own mountain without anyone else around. This was exactly what we were looking for. We pretty much stayed at the cabin for the weekend because it was what we needed but on our next stay we will be visiting the trails and things. I am a home bug & usually get homesick after a couple days away from home. During our stay at Laurels rest I never got home sick and I was actually disappointed that we had to leave. We are definitely looking forward to going back soon! We stayed at the Windrush and it was absolutely perfect. Immaculately clean special thanks to Mike for a great job and the extra care he takes to be sure everything is tip top. The cabin was roomy and comfy! Kelly was amazingly welcoming and diligent in being sure we had everything we needed and even scheduled Lisa (the masseuse) who rubbed away all of the aches from our hiking excursions. We cant wait to come back and next time we are bringing the family! We had to come back a second time. We love it! Raccoon Lodge is beautiful with amazing views from both an upper and lower porch. The cabin offers complete privacy. The cabin was wonderfully decorated and very comfortable. The staff is also excellent and goes out of their way to make your trip special. We are already planning next years trip. My husband and I stayed at the Sassafras Ridge cabin for our 10 year anniversary. It was everything we expected. All the cabins are very secluded for that perfect romantic getaway we were looking for. The back balcony with the hot tub overlooked the deep wooded forest for extra privacy. The hottub is covered so we got to enjoy it during the rain. The cabin was very spacious with a wood burning fireplace to cozy up next too just be sure to take some firewood or purchase before you get to your cabin. It rained during our stay, and the rain hitting the tin room made it much more relaxing. These cabins are truly secluded. We are already planning our next stay at the Wilderness View Cabins. Sadly my husband and I left the Cliffhanger cabin today. We wish we could have stayed longer! The cabin was beautiful, the staff was wonderful and the views are breathe taking. We actually got married during our stay at the cabin. Kelly made all the arrangements from the flowers, to the minister, the photographer and the cake. It was so stress free and easy... She did everything. Our ceremony was so wonderful and intimate, we couldnt have been happier. Our 1st anniversary is so far away, so we plan to be back sooner. 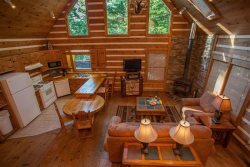 Would highly recommend this cabin to anyone looking for a intimate and quiet place to relax and unplug!